Droyd Cantina: Google Music to Launch Together With Honeycomb? Google Music to Launch Together With Honeycomb? The long-awaited... I wrote that now some times. But Google Music may find the way very soon to Android. Honeycomb to be precise. Image by keso via FlickrThat's what CEO Sanjay Jha said according to the Guardian UK. Wait does that means it comes only to Honeycomb? No Froyo or Gingerbread love? I hope not. This could be the worst mistake in the history of Android. The cloud music service is very important for the very near future. It's important that Google gets this out to as much devices as possible. 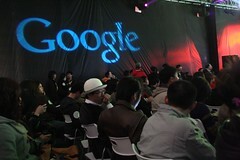 The service was shown at the Google I/O 2010 and was rumored to launch "soon" many times. Now let's hope it isn't a rumor that it launches, but a wrong conclusion that it will launch for Honeycomb only at first. Oh and btw. using Jamendo over the cloud is very nice. But the battery is drained in no time. I hope this is a problem with the app and not a general problem of data getting sucked over 3G. This would only make cloud music interesting when you're around a charger. When does the battery-industry will keep up with the new tech-stuff? looks like they're stuck in the 90's.